Linda Cracknell is an-award winning writer based in the Scottish Highlands and known for her creative approach to exploring wild places and man’s interaction with them. Walkhighlands will be publishing a specially-commissioned piece emphasising the cultural aspects of the Scottish landscape on a quarterly basis. ‘I think I’ve fallen in love,’ Kate said, less than 24 hours into our enchantment. We were sitting on a small hill on the island’s south east corner, looking north towards the village, the ferry plying to and fro from Fionnphort, the abbey sunlit and watchful beyond. To the south-east the archipelago of islands and skerries that make up Erraid on the Isle of Mull floated black against sea-glister. 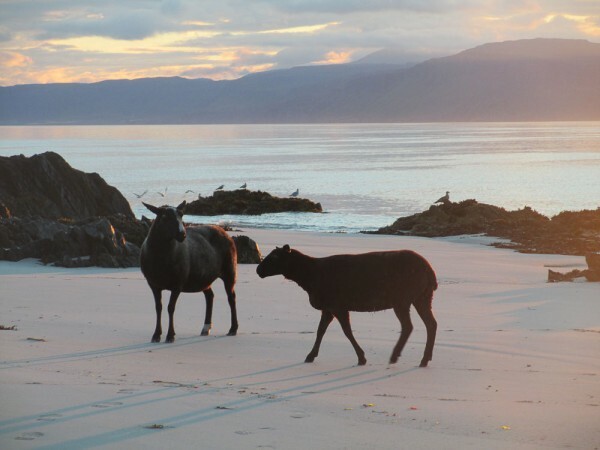 That morning I had padded barefoot on sheep-cropped grass to watch the sunrise from the white sands at Tràigh Bàn nam Manach on the eastern side of the north point, close to the Hostel where we stayed. Views across the sound revealed layer after fading layer of mountain silhouettes on Mull and the mainland beyond. On Christmas night 986, an abbot and fifteen monks were killed on this beach by Viking raiders. I shared its melancholy with the silhouettes of waking sheep, turnstones strutting and pecking in the shallows, sprinting rabbits. Kate and I had thought of Iona as a destination for a walk, a sort of ‘locus sancti’ to walk to. For the last two years she’s been training as a Unitarian minister and we’ve chosen a walk each year roughly underpinned by the idea of pilgrimage and moving further towards a special place each day (though softening any sense of hardship with bed and breakfasts each night rather than my more usual tent and stove). But we had struggled to find a satisfactory route across the Ross of Mull, and decided to just get to Iona and then establish what to do. John Maclean, whose Hostel we stayed in, introduced us to the idea of the ‘ex patria’ pilgrimage which concentrates on departure rather than arrival. For the early Irish saints it meant foregoing home and family to carry a message out to the world on foot (or across water). So perhaps, we thought, we would even walk away from the island. Quickly contented with circularity rather than walking a line however, neither of us now wanted to leave. We surrendered willingly to a benign trap within Iona’s labyrinth, to the enclosed bounds of an island we could see when we climbed its highest point at Dun Ì. Repeating my tour of the north point each morning became a satisfying ritual. Each sunrise offered a distinct experience – the light one day a blaze, the next hanging in soft veils. But my way between rock, field and sand offered landmarks that became trusty friends as I toured over to the west beach and then back to the Hostel for breakfast – this repetition my way of making a place my own. At three and half miles long by one and half wide, serious distance walkers or those driven to reach mountain summits are not going to find their paradise on Iona whose highest peak is 330 feet. The scale is reminiscent to me of the Scilly Isles; it’s un-Scottish somehow, and takes a while to adapt to after crossing the sweeping remoteness and grandeur of west Mull. A human figure suddenly looming on a headland would shrink what had seemed an epic bay; a distant hill surprise us by being under our feet in only ten minutes. This mid-September was warm and golden, the sea enticed and glistened, then bit ferociously. Nevertheless we swam each day. The peat bogs were crisp underfoot; the ground skipped beneath our feet. Seedheads of meadowsweet rattled and house martins scudded around our heads. Starlings gathered on rooftops and punctuated cables like notes on a stave, sleek and speckled, twittering to each other against bold blue skies. In three days we circumnavigated the island, climbed its Duns and swam from its quiet beaches. Inevitably the circular walk we took each day knotted together with a previous circle, or stretches were repeated. On the southern tip where Columba is said to have landed in 563 AD, we basked in the sun on the conical rock which bisects the bay, watched a grey seal follow two kayakers ashore and raise its head to stare after them as they clattered onto the pebbles dragging after them their buoyant shells. 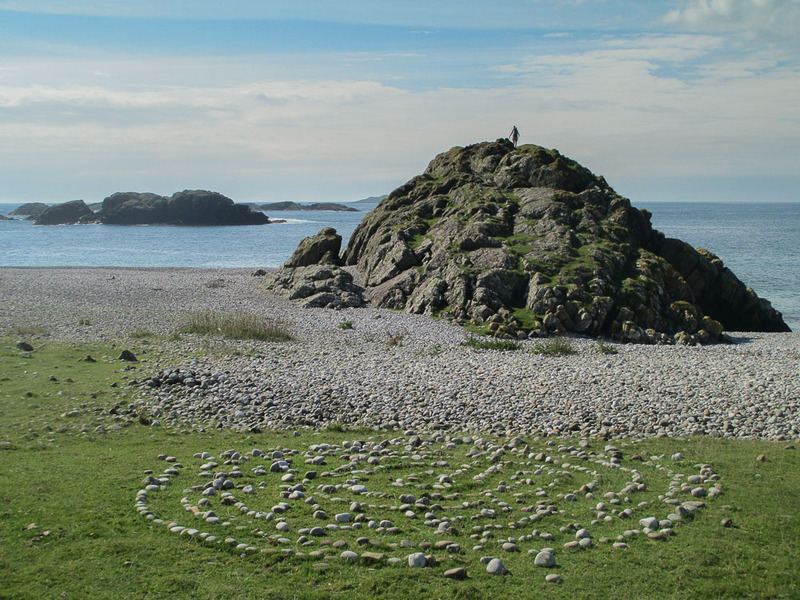 A wide green apron just inland was decorated with pebble art – labyrinths and Celtic crosses – left by many visitors. A walking service of about 30 people stopped on the beach for prayers and then, as is the custom, each hurled a pebble into the sea before leaving, discarding something that was weighing them down. Walking is inseparable from the Iona experience. Few people except the island’s residents arrive by vehicle; tourists are forced to walk. Pedestrianism reinforces the sense of peace. It also levels people and encourages camaraderie. Returning along the North Road to the Hostel one afternoon, we were greeted excitedly by each group of oncoming walkers: ‘Have you seen them? Have you seen the dolphins?’ And sure enough there was a pod performing a triumphant display in a long arc down the sound towards the village. As a honey pot for day-trippers and for both religious and secular pilgrims, there are some busy ways. 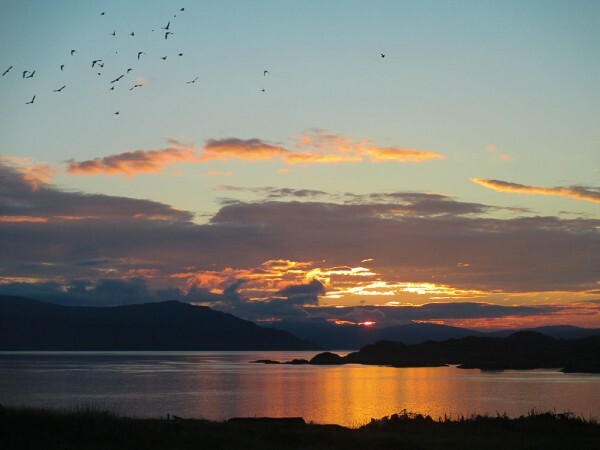 One takes visitors north between ferry and Abbey; another from the ferry west across the island to the machair and a huge scoop bitten from the shore – the ‘Bay at the Back of the Ocean’ (Camus Cùl am T-Saimh) – then further south on a good path to Columba’s Bay. After the last party has crocodiled into the jaws of the ferry crossing the water to their coach at Fionnphort, it is as if the tide closes and the island breathes out a sigh. It’s a privilege to remain. Walking elsewhere on the island, albeit often on hoof-beaten ways rather than a made path, we were surprisingly solitary. We carved our way through the wild stretch of north-west coast through a maze of small valleys winding between gnarly outcrops of rock, occasional high Duns. Joyfully, there was no bracken to wade through. We were finally led down with heat moistened skin to swim at Port Ban. 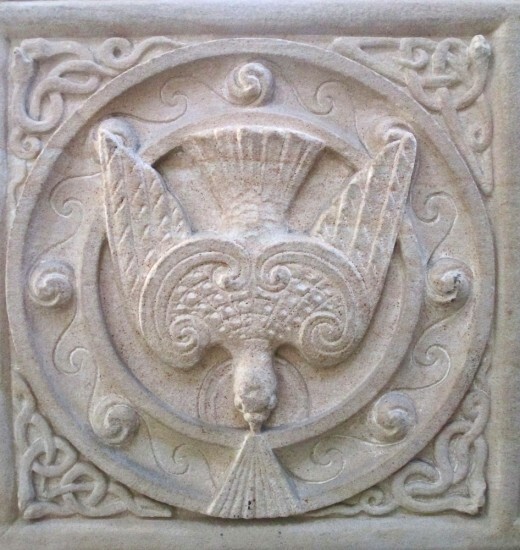 Startling natural beauty combines with a history and culture made material in ancient stones, graves, mystical stories and place names; the knots and spirals of Celtic art. In the usual mingling of pagan and Christian that seems to accompany early saints and their journeys, Columba’s miraculous powers allowed him to calm storms and sea monsters. Unsurprising in a place previously associated with Druidic practice, a mound near his arrival point has two possible names, attributing it either to fairies or angels. The nunnery, ruined during the Reformation, is reputed to boast the splayed legs of a sheela-na-gig as decoration and also depicts a prioress with a comb and mirror, making her in my mind double as a mermaid. For Kate, the earthy roots of Christianity here chimed with Unitarianism. 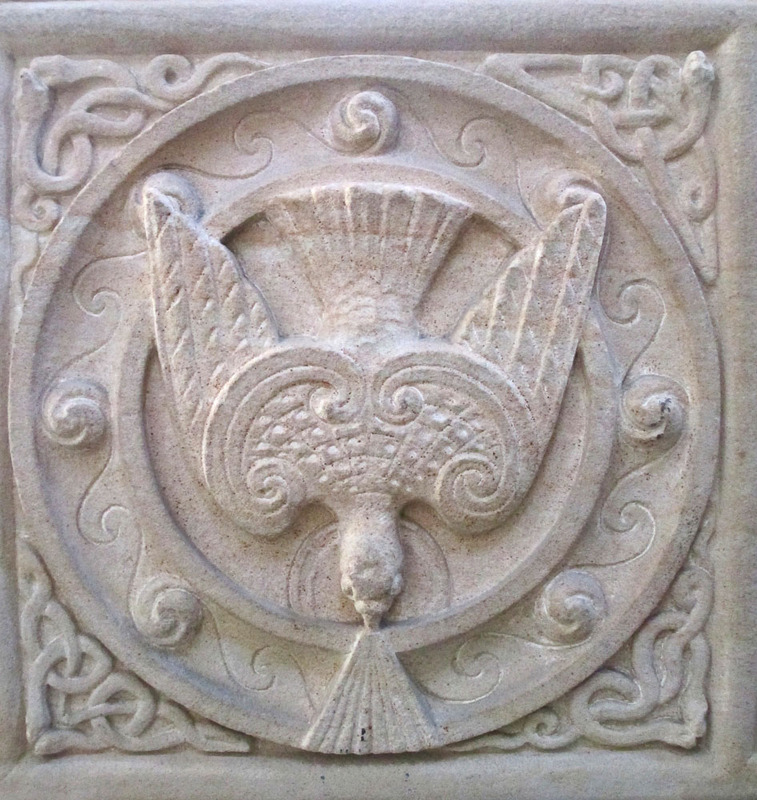 Although it has its roots in Jewish and Christian traditions it is open to insights from all faiths, science, the arts, the natural world and everyday living. It is such a broad church that even atheists can be embraced. The scale and compression of the island acts like a poem arrowing into hearts and minds. It’s unsurprising that it’s proved inspirational to writers including Columba himself whose enviably-placed writing hut on the Hill of the Abbot (Tòrr an Aba) is a small distance from the Abbey. The island became a hub for religious writing – a scriptorium – and was where the Book of Kells was created. These days, writers such as Roselle Angwin and Kenneth Steven bring groups here each year for creative writing workshops which draw on exploration of the island and its particular sense of place. With two stretches of sea to cross to reach this giant’s footstep into the west, we could be forgiven for feeling on an edge. And yet Iona seems to float — a place that doesn’t quite belong to anyone or anywhere, that refuses to be located. Contrarily, despite our apparent remoteness, we experienced a sense of global connection. Our hostel was home to Taiwan, Italy, USA, Norway, Switzerland. Postcards were duly sent out into the world. A corncrake strutted in the Hostel garden, nonchalant of its celebrity status, and within days of departing on its long flight to South Africa. And as I woke on one of my first days back at home, John Bell of the Iona Community gave his Thought for the Day on BBC Radio Four about our involvement in Syria’s hurts, a typical linking of world justice and faith arising from the inspiration of this tiny island, its power disproportionate to its size, ranging across borders and seas to excite imaginations. It was Alistair Rutherford’s play for radio, and later stage, An Island between Heaven and Earth, that first introduced me to George MacLeod, the visionary Church of Scotland Minister who founded the Iona Community. As Minister in Govan in the 1930s he witnessed despair and poverty arising from the decline of shipbuilding on the Clyde, and hatched a plan to bring unemployed shipbuilders to work alongside trainee ministers, restoring the ruined Iona Abbey buildings. Work began in 1938. The play beautifully evokes the spirit of this venture, and the grit and heave of the old stones being reset in walls by these men cooperating across two such different cultures. MacLeod’s project was a human articulation of his idea of Iona as a ‘thin place’ where only a tissue paper separates the spiritual from the material. Our explorations of the south of the island took us to the remains of the marble quarry in a gully that tumbles shining white stone down to the shore – slabs cut but never collected. It’s obvious how hazardous a landing it would have been for ships, and why the quarry closed in 1918, despite this beautiful stone being one of the only ‘true’ British marbles (the others being from Skye and Tiree). 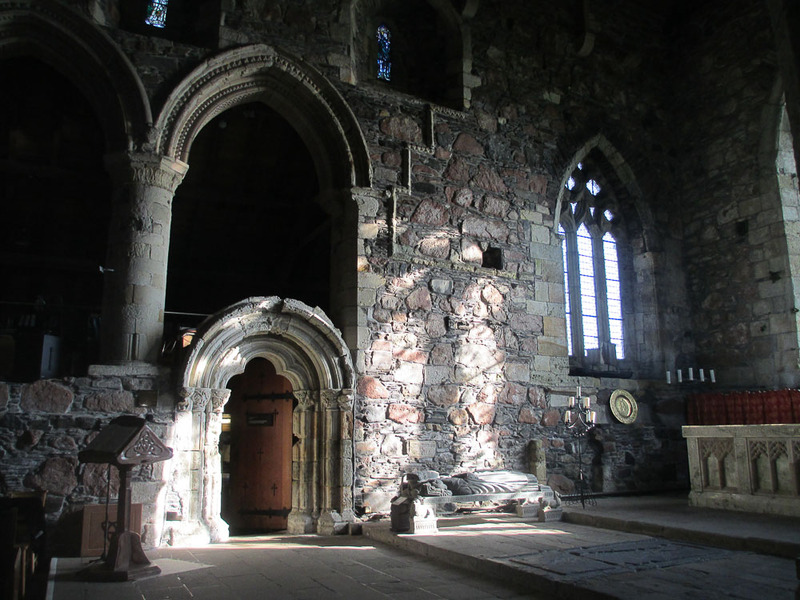 The marble, predominantly white with greenish veining, was used in the 13th century Iona Abbey as well as other religious buildings such as Westminster Abbey and in Jerusalem. It’s long been sought for amulets, believed to protect against various misfortunes, and sea-polished pebbles of it, or ‘Columba’s Tears’, are still collected by beach-combers on the south of the island. It made me think of the restoration of Edinburgh’s Scotsman Steps that link Market Street to North Bridge. Before 2011 the steps spiralled up through wind-banked rubbish and rough-sleepers. Then Turner Award-winning Martin Creed was commissioned to replace each step with marble of a different colour and from a different part of the world. It’s a piece of art made afresh by each new pedestrian, representing Edinburgh’s internationalism. Disappointingly the steps don’t include any Iona marble, the nearest in colour and source being Irish Green from Connemara which masqueraded as Iona marble during the years of greatest demand for the talismanic jewellery. Toilet and cathedral. Shipbuilders and church ministers. I enjoy this doubling of earthly and sublime. Saints walked on Iona and presumably suffered blisters. A golf course with divine views doubles as grazing so the players have to negotiate cowpats and bunker flags may be eaten by sheep. When we left the blaze of day to enter the cool gloom of the Abbey Church, fragments of light and seascape sparkled on ancient stone; candles glowed. The prickle of inevitable awe was satisfyingly grounded against the sound of sweeping, the clonk of workers’ footsteps. 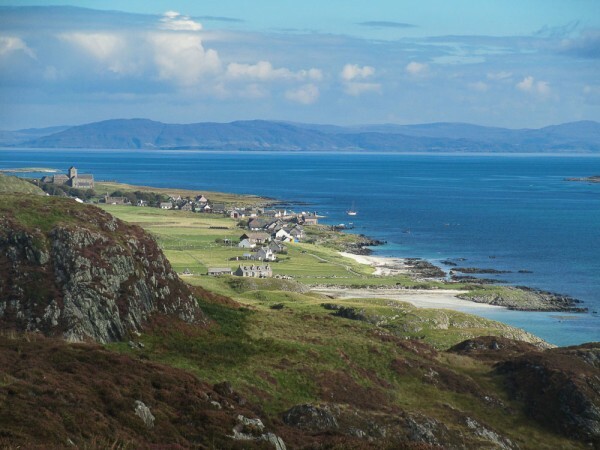 There was one sense in which Iona was umbilically linked to Scotland that week as the island’s small electorate voted on Scotland’s future, and the world awaited a result. We walked to John Smith’s grave along the millennium-old cobbles of the Street of the Dead (Sraid Nàm Marbh) and pondered his place amongst Abbots, Lords and Warriors. ‘An honest man’s the noblest work of God,’ we read on his simple stone upon which has been laid a border of tiny pebbles, as if claiming him for us all. We pondered how current events might have played out differently had he lived longer than his 56 years. Later that evening we stepped into the candlelit cloisters after a service in the church. 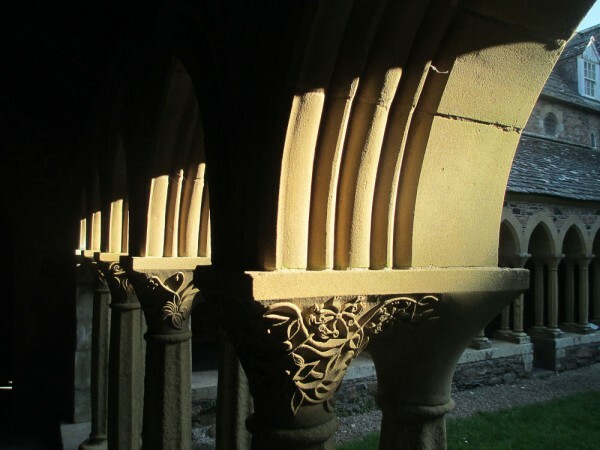 It was here between the shadows and columns around the square that the Abbey buildings evoked in me the strongest sense of ancient spirituality; where I felt whispered meditations and prayers. It may be true that we walk in circles when we think we are lost, that we think of running in circles as achieving nothing, but here footsteps rotating around a centre evoked something more focussed and meaningful. No one is in front or behind; there’s a place for everyone; thoughts are played out in foot-rhythms in a beautiful enclosed space. And eventually they rise and spiral outwards. Each column in the cloisters was crowned with a carving taken from the island’s material bounty – curlews, skylarks, sundew. A small group of us looked up to the heavens through the open courtyard as a helicopter lifted nearby just after 10pm. The ballots had been collected and a red tail light diminishing towards the next collection point on Tiree signalled democracy in action. 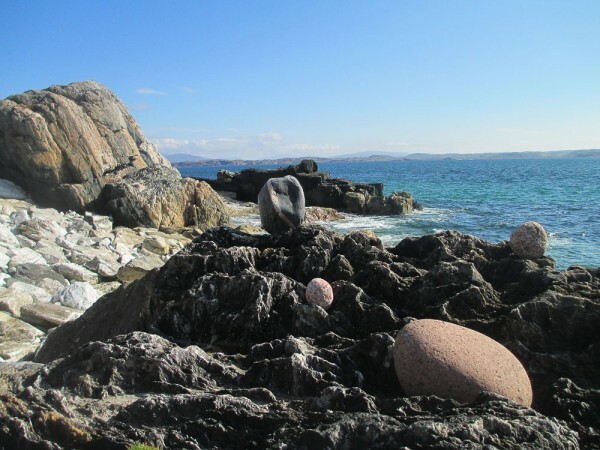 Before leaving, Kate and I each found a pebble to hurl into the sea, relieving ourselves of some ill, and then we journeyed outwards from our new found centre – by boat and bus and boat and bus – taking Iona with us back into the world. Kate carried it to her first parish in Plymouth, and I back to my world of books and words with heather knotted in my socks and my mind refreshingly stilled by walking within small bounds.